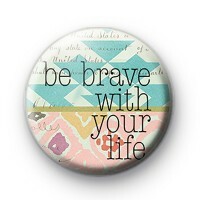 Fun, positive and uplifting slogan pin badge. This has the text Be Brave With Your Life - which is a really nice saying. Our handmade pin badges are a great way to spread positivity and radiate some hippie vibes. OMG - Loving my True Blood Badges. I wear them with pride.